If you got a new Cricut Machine for the holidays (or are just getting reacquainted with the one you already had 😉 ) - then you know that stocking up your craft closet can be a challenge and a big expense too. I know for a fact that I am going to make mistakes - lots of them - because while a Cricut is easy to use, it still requires skill and practice. And lots of supplies. Save 30% off Iron-on Materials. Valid through 4/2. Cricut Explore Air 2 machines starting at $269. Valid through 4/2. Save 30% on Cricut Maker materials! Valid through 4/2. 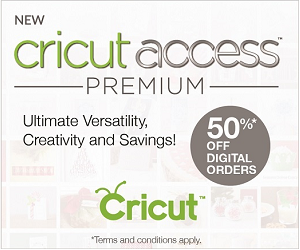 Cricut EasyPress 2 bundles starting at $159. Valid through 4/2. FREE Economy Shipping on orders $99+ to US and Canada. Use code MARSHIP. 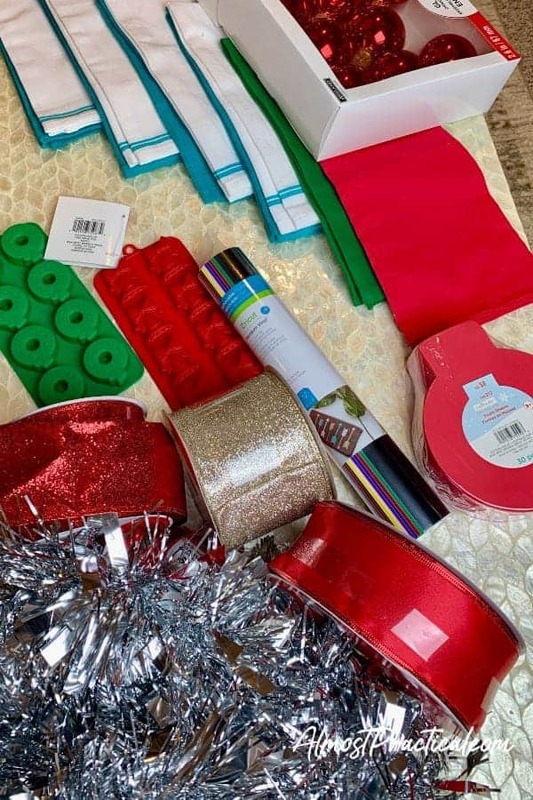 So, just yesterday - keep in mind that it is now the middle of January - I went into my local Michael's with the sole purpose of buying some Cricut vinyl in red and green, because I want to label my Christmas decor boxes for storage. 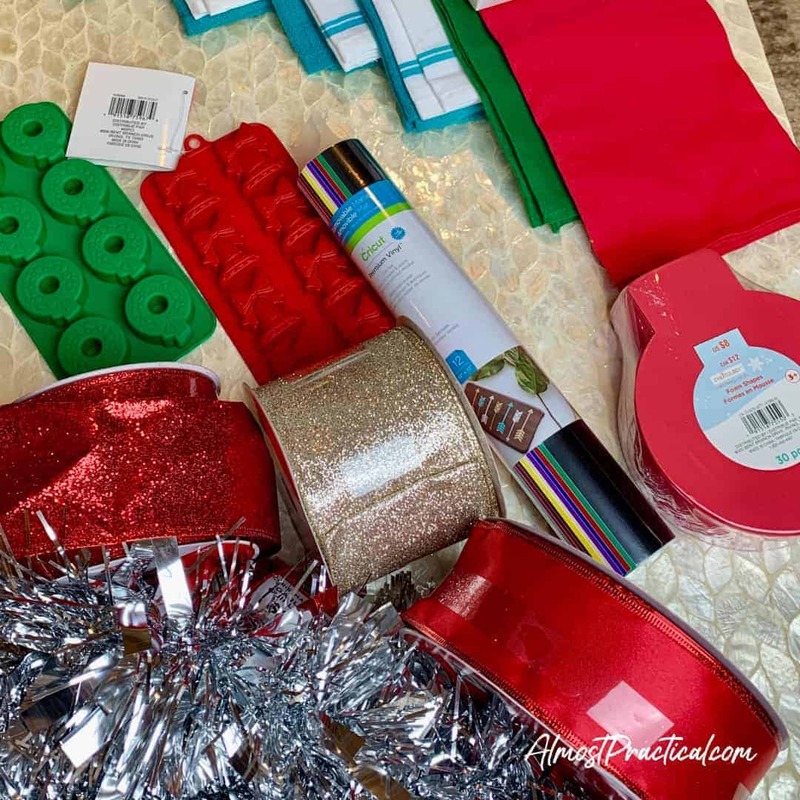 Well, I did come out with a Cricut vinyl sampler at regular price, a craft cart, an ice cream scoop - yes, that - and a HUGE haul of Christmas markdowns. Now, I usually shy away from after Christmas sales because we just do not have the space to store any more stuff. But this year I had Cricut on my brain and I looked at everything from a very different perspective. New to Cricut? 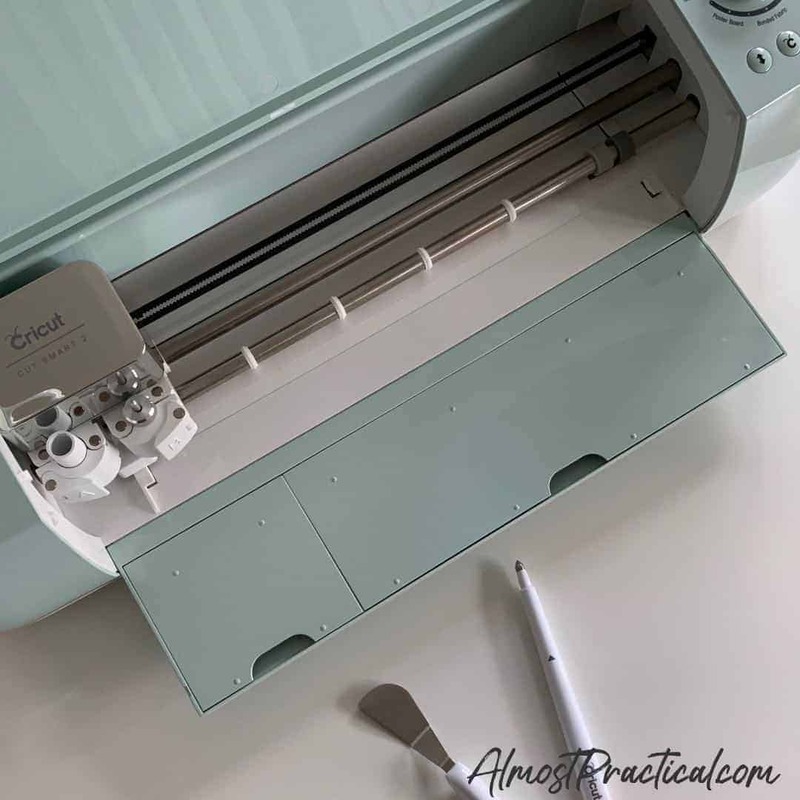 Find out what a Cricut machine is and examples of what it can do here. See my Cricut Maker machine unboxing here. I found some nice plain tea towels not only in red and green but also in this bright teal color that screams summer to me. Talk about a great hostess gift and also an excellent way to practice with HTV (heat transfer vinyl) as well as your Cricut Easy Press machine. Once Christmas is behind us, the next big holiday is Valentine's Day. So, a lot of the red Christmas markdowns can do double duty in February. The red tea towels that I picked up will be great for this. I also found a stack of pink and red craft foam in large circular ornament shapes - again perfect to cut into heart shapes for Valentine's Day. Storage is definitely an issue in our house, but I did snap up some plain glass ball shaped ornaments in red and green anyway. I can imagine dressing these up with a snowflakes in silver glitter vinyl - or a few other possibilities. They would also make pretty hostess gifts next year or additions to your own tree. I even found a stamp and emboss set of reindeer, snowflakes, and trees which I thought would be fun thing to do on my new Cricut Cuttlebug machine. Yes, I am unofficially a Cricut fangirl. But since I am not a stamper, little did I know that I would need an acrylic block like this one to mount the stamps. Because it is so far after Xmas, most things were knocked down by 80% or more which means that almost everything I got on sale was around $3 or less. I know that a lot of people shop at Dollar Tree to get cheap craft supplies for Cricut projects. But we don't have one close by - so I was pretty happy with the after Christmas sale at Michael's. Where Do You Buy Supplies for Your Cricut Projects? Even though I have had my Cricut Explore Air 2 for awhile, it took me a long time to warm up to it. So, I turned around and upgraded to a Cricut Maker machine - which of course was the logical thing to do. I hope you hear the sarcasm there. But in all seriousness, I am determined to really learn it and put it to good use. Which is why I would love to hear about some of your "insiders" secrets to finding quality project materials at low prices. Also, if you use your Cricut machine to reuse and repurpose old things - I would love to hear about that too. Please do leave me a comment below!